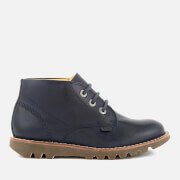 Men's leather boots from Kickers with genuine leather uppers and reinforced rubber soles. Showcasing Kickers' trademark hard-wearing style, the 'Kick Hi' boots feature a lace up front and contrast triple stitch detail throughout. 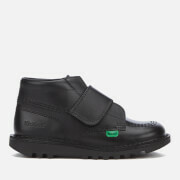 Complete with embossed logo to the heel and green and red branded tabs.